Canker sores are shallow ulcers that can form inside your mouth for many different reasons. You know when you’ve got a canker sore happening because of the curious discomfort you suddenly feel in your mouth. In truth, these oral tissue skin ailments are usually more of an endurance test than any real pain. Their sore itch inside your mouth is super annoying, and when you get more than one happening at once they can make eating and talking really uncomfortable. But relax. They’re not contagious. Nobody has ever died from canker sores, and only in rare cases are they symptomatic of any larger health issue. 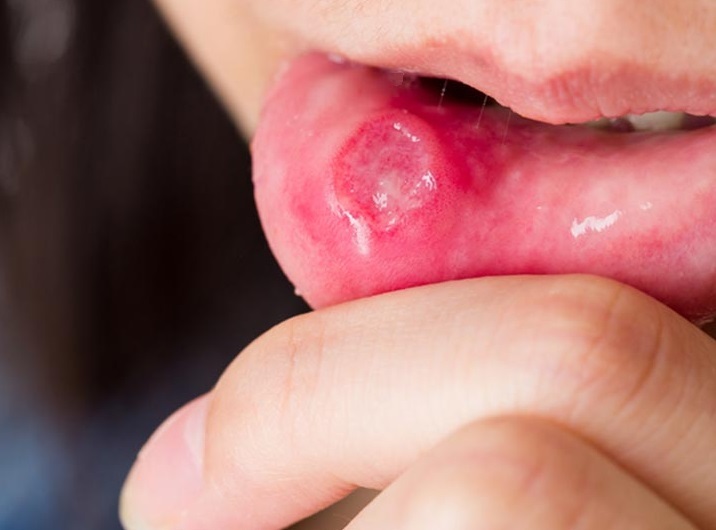 Canker sores are aphthous ulcers most commonly found on the soft tissue of your cheeks near your lips, and if you’re real unlucky they can appear on the roof of the mouth or on your gums. That’s no fun. Women are twice as likely to get canker sores than men, and young people in general between the ages of 10 and 20 are the most commonly afflicted, although canker sores can appear earlier in life and elder folks suffer too. Anyone can suffer canker sores at any age. There are two types of canker sores. Simple canker sores may appear three or four times a year, and can last up to a week. They typically occur in people ages 10 to 20. Complex canker sores are less common and occur more often in people who have previously battled an outbreak. More on the two types of these skin ulcers later in this blog post. Canker sores are red and puffy skin blisters inside the mouth. Sometimes they appear all white and sometimes yellow and sometimes they have a small red border surrounding them. This is one of life’s little mysteries. There is no one single cause of canker sores. There are several. An unexpected outbreak could be your body reacting to stress or raging hormones, or maybe you’re eating an improper diet and making poor lifestyle choices. Some food preservatives have been known to trigger canker sores and many sufferers complain about Sodium Benzoate in particular. Produced by reacting sodium hydroxide with benzoic acid, this substance has the chemical formula C6H5COONa, and is a widely used food preservative, with an E number of E211. Sometimes minor tissue injury caused by a snagged-tooth or ill-fitting braces can manifest as the less complicated type of canker sores. Add to that list certain foods including and especially grapefruits, lemons, oranges (all citrus fruits), apples, figs, tomatoes, pineapples, and strawberries. These sour (mildly acidic) fruits can trigger a canker sore outbreak or exasperate an existing canker into a full-blown attack. Complex canker sores by contrast can manifest in your mouth in response to an underlying health condition, such as an impaired immune system. They can also signal more complicated nutritional problems, such as vitamin B-12, zinc, folic acid, or iron deficiency. Severe, reoccurring canker sores may indicate gastrointestinal tract disease, such as celiac disease or Crohn’s disease. If you have a canker sore, you’ll want to get rid of it as quickly as possible. Rinsing you mouth with salt water is also a great way to reduce inflammation and encourage faster healing. To relieve the irritation, you can use a topical medication, a special mouthwash, or oral pain relievers. There are all manner of ointments and balms available on drug stores shelves which specifically treat canker sores. Most of these topical applications which both relieve pain and speed healing have Benzocaine or Boric Acid as the active ingredient. On the prevention side of things, you might try brushing with a softer bristled toothbrush which may be easier on your gums. Also have a look at the toothpaste you’re using, and perhaps try a brand without the ingredient sodium lauryl sulfate. Watch the SciShow video here for more ideas and insights into canker sores. No. Canker sores are not the same as cold sores, which are also called fever blisters or herpes simplex type 1. Cold sores are groups of painful, fluid-filled blisters. Unlike canker sores, cold sores are caused by a virus and are extremely contagious. Also, cold sores typically appear outside the mouth, usually under the nose, around the lips, or under the chin, while canker sores always occur inside your mouth. How to prevent canker sores in the future? There are natural preventative remedies such as salmon, kale, carrots, parsley, spinach, and yogurt. These base foods can help reduce future ulcer breakouts because of their high vitamin B12, iron, and folate content. Flossing daily and brushing your teeth twice a day will also help reduce ulcer breakouts because a clean mouth is always healthier. How can Archer Dental help with your canker sores? If you’ve been struggling with severe or repetitious minor outbreaks, please schedule a dental appointment. There may be underlying causes of your canker sores that need immediate diagnosis and treatment with prescribed medication.